The flag of the Borough of Brooklyn is based on the flag of the old City of Brooklyn, which of course lasted until "The Great Mistake of (18) '98" of union into Greater New York. You can find one of the old flags on a wall in Borough Hall, right next to the new Brooklyn Tourist Office. The motto on both flags is, "Een Draght Mackt Maght", meaning "In Unity there is Strength". This is also the meaning of the fasces the woman is carrying, a traditional Roman and Classical Republican symbol of Unity, expressed by the rods bundled together around the axe. This was before this symbol was degraded by Mussolini. I have seen old magazine illustrations from the controversial period before the 1898 creation of Greater New York, and the editorial cartoons always show Brooklyn as a woman, as opposed to her male suitor of New York. So the woman may represent Brooklyn herself, and the rods of the fasces the many towns from which the City of Brooklyn was itself formed. § 2-105 Official flag; borough of Brooklyn. a. The following description is hereby adopted as the description of the official flag of the borough of Brooklyn. A white background in the center of which is the design of the seal. Within the seal appears a figure of the goddess of justice in gold holding Roman fasces in her left hand set on a background of light blue. 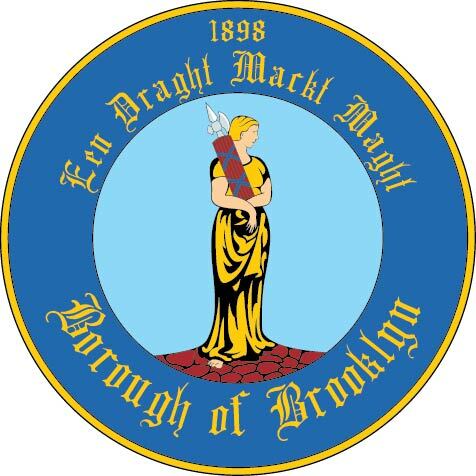 Encircling her figure on a background of dark blue appear the words "Een Draght Mackt Maght" the old Dutch motto for "In unity there is strength" and below the words "borough of Brooklyn." The outside and inside trim of the seal is gold. Brooklyn is today represented by one star in the inner circle of the NYC Police Department flag , being one of the three cities (as opposed to towns and villages) that formed the City of Great New York in 1898 (along with the existing City of New York and the Long Island City). I came across this flag at ih.constantcontact.com/fs172/1102557709761/img/785.jpg. According to the information on the website, the white flag with the blue seal in the background is the flag of the Borough of Brooklyn in New York City. This is perhaps a variant or new flag design, but appears to be an official flag, considering the setting and circumstances in which it was displayed in the linked photograph [displayed in court house or chambers setting with the national and state flags]. This Brooklyn flag features the borough's seal centered on a white field. The seal itself can be found at cdn.firespring.com/images/b98bec00-c934-4080-9c06-af4b838c80eb.jpg. The seal features a woman (Liberty? Virtue?) standing on a rocky ground facing the viewer's right and holding a fasces. Below the image are the words "Borough of Brooklyn" in white Old English script. Above the image is the motto "Een Draght Maeckt Maght" in the same script. Above the motto, and still within the ring of the seal, is the date 1898. I question whether this is "official" or a poor job by a lazy manufacturer. Just because it is being displayed it may not be official. I have in the past seen flags on stage with the Mayor, that were not official. Don't jump to conclusions. Maybe the seal has now found its way onto the flag but I don't think it is very official. Prior to being annexed to NYC Brooklyn had a similar flag with the goddess but not in a seal-like form. Brooklyn, my home and now one of five boroughs of New York City, was once its own city. Indeed, for much of the 19th Century it was the third largest city in the U.S. (Today, it would be the fourth largest). So I give you the flag of the old city of Brooklyn, which by its end had about one million inhabitants, making this its flag rather an important, if forgotten, piece of vexillological history. The image above is a rather cleaned up and rejuvenated version of a photo I took of an old hand-painted flag on display inside Brooklyn's current Borough Hall and former City Hall. I have not thoroughly researched this flag's history, but I can say that the municipal entity of the City of Brooklyn existed from 1834-1898, gradually growing from its origins out of the Village and then Town of Brooklyn across the East River from Lower Manhattan to eventually absorb all of Kings County, before itself being subsumed into New York City, in what some here still call, largely tongue in cheek, "The Great Mistake of '98." Note of course that this City Flag with its fasces-bearing young woman is the clear inspiration for the current Borough Flag, which has inevitably fallen a bit into modern vexillological decadence. The modern flag confines the woman's figure into a rather unnecessary seal, while incidentally changing the color of her robes from apparent light blue to gold, and of her hair also from red to a golden blond. Also note the spelling of the motto on both flags "Een Draght Mackt Maght". The translation could perhaps also be more accurately rendered, "In Unity there is Strength." This is how our Borough President has cited it, and it seems to fit the form and apparent meaning of the Dutch words better, at least to one as I who does not speak Dutch. I think I should make clear concerning the seal on the flag, that it is NOT the same as the seal of Brooklyn. The official seal of Brooklyn shows the woman in a more frontal, rather than profile, view. Apparently the seal was altered for the flag, with the woman in profile having a clearer silhouette and better able to 'march' on parade, if that ever came up. You can find some images on the Brooklyn Borough President's website: www.brooklyn-usa.org. I have heard that the fasces represents the union of the old towns. The 'official' colors of Brooklyn are blue and gold - I have seen them used as such on an official document (ribbons on the seal). The spelling of Dutch in the 17th century was still very haphazard and various different spellings of the words 'eendracht', 'maakt' and 'macht' is very likely. I have never come across the spelling 'mackt' on the flag for 'maakt' before and have a sneaking suspicion that it is at best a mistake or at worst an English corruption that have crept in over the centuries. My Dutch is, however, also suspect (I can read it but would never dare write it), and one of our Dutch members could perhaps give a more authoritative answer. I assume it means they were ordering a new copy of an existing City Flag. In 1895, just before the City Aldermen of Brooklyn voted to join in the Greater New York City plan, an opposition group, the League of Loyal Citizens, had a stirring flag song written in opposition to the plan. The pertinent words and information follow. You can see the front page of the song sheet. 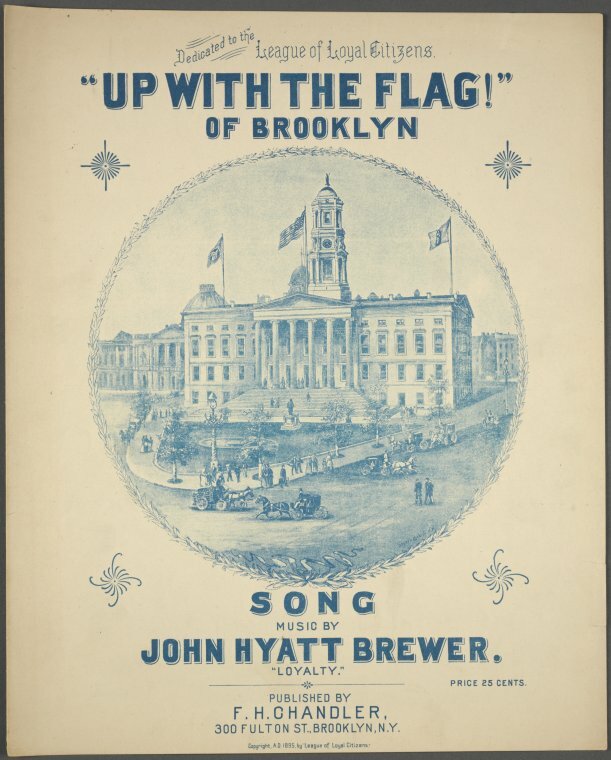 The image on the cover of the song sheet shows Brooklyn's City Hall in 1895 flying three flags: in the center is the US Flag, on the left in the view (the building's own right) is what I think is the New York State flag of the day, and on the right (the building's own left) is a plain flag with a figure standing in the center--clearly the Brooklyn City Flag (but without the lettering as far as I can tell, perhaps artistic license at this scale). Would love to get a better image someday and I will search for it. Up With The Flag! Of Brooklyn! Published by F. H. Chandler, 300 Fulton Street, Brooklyn, N.Y.
Unhurt by factions with'ring blast. And nail it to the mast. The treasures that we hold most dear. Of ruin would these tricksters cast. And buried in the book of shame. Her banner to the mast. To save thee from the hated thrall. The flag of Brooklyn features the borough's seal centered on a white field. The seal features a woman standing on a rocky ground and holding a fasces. Below the image are the words "Borough of Brooklyn" in white Old English script. Above the image is the motto "Een Draght Maeckt Maght" in the same script. What is "Een Draght Maeckt Maght"? Eendraght Maeckt Maght - L'union Fait La Force - Einigkeit macht stark - Unity makes Strength. All of those mean more or less the same thing, and they all are good mottos and are in use around the world. Een Draght Maeckt Maght - Une Gestation Fait la Force, Schwangerschaft macht stark, Pregnancy makes Strength - well, there's some truth in it, in a way, but it's not such a likely motto, and isn't used all around the world. Indeed, the motto on the present and past flags of Brooklyn as well as the current seal is "Een Draght Maeckt Maght" which the borough says means "Unity makes Strength". Must be some sort of pigeon-Dutch, no? 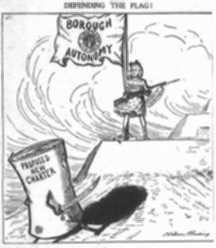 Brooklyn's flag was well advertised back in the day (before annexation), it even had its own song. In the song, however, the translation is somewhat different. Here is the transcription from the sheet music. "Eendraght Maeckt Maght" would be the correct spelling, of earlier times, and could indeed be translated as "Unity makes Strength". It's interesting in that it seems to come with dating included: I'd say by 1800, the spelling "ae" was becoming quite rare. On the other hand, the abstract meaning of "eendracht" as "unity" first came up around 1500, with the older meaning being the more concrete "agreement". This motto would then be from 1500-1800, more likely from 1600-1700. The Roman Catholic Diocese of covers the boroughs of Brooklyn and Queens in New York City. Information about the diocese may be found at en.wikipedia.org and its official website is at www.dioceseofbrooklyn.org. The flag of the Diocese of Brooklyn can be seen at www.thetablet.org/pictures/rally6.jpg, with context at www.thetablet.org/02182006/stories.html. The flag consists of the diocesan arms on a white field above the wording DIOCESE OF BROOKLYN in dark blue lettering. Without doing a formal heraldric blazon, the arms can be described as thin gold Latin cross, separating quarters of red (1st and 4th quarters) and white (2nd & 3rd). At the center of the cross is a small white inescutcheon with a red scallop shell. In the 1st quarter is a gold crown with enclosing arches, in the 2nd quarter is an open gold crown. The 3rd and 4th quarters each have a circle with 6 alternating wavy bands of white and blue. The crest of the arms is a golden mitre. A small, but better, image of the arms is available at www.mhtbrooklyn.org/images/Bklyn%20Dio%20Shield.bmp. The above source for the photo of the flag is a page from the 18 Feb 2006 online edition of the diocese's newspaper The Tablet, which covers a rally in Albany, the state capital, by religious and independent schools, their students, and the parents, seeking authorization for tax relief for payment of tuition to such schools. The article also contains some photos of flags and banners for some of the participating schools. 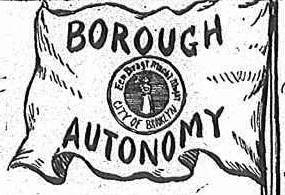 This cartoon shows a flag of the city of Brooklyn, with the word "Borough" above the seal and the word "Autonomy" below it, both all-caps. But I don't know whether such a flag actually existed, or whether they re-created it from a borough of Brooklyn flag. It's interesting to note that this seal depiction from 1909 already has "One Pregnancy Makes Power" ("Een Dragt", rather than "Eendragt"). Apparently this has been around for quite a while. On 22 July 2014, around 4 o'clock in the morning, the American flags on either end of the Brooklyn Bridge were replaced by white flags. As the lights that allow these flags to be flown through the night had been covered, the switch was first found out after daylight had come. The two "white" flags turned out to be bleached U.S. flags, but that was about all that was apparent. The police, however, were going to take this seriously, they said. After three weeks of the police taking it seriously, two German artists, Mischa Leinkauf and Matthias Wermke, revealed that they had switched the flags to "celebrate the beauty of public space". The day they chose was the anniversary of the death of the designer of the bridge in 1869, the German-born John Roebling. They supported their claim with photographs and videos. They said they had no intention to provoke, and promised to return the ceremoniously folded American flags they had replaced. I've now found a picture taken without the sunlight flooding the whole flag white: news.yahoo.com/mysterious-white-flags-appear-atop-brooklyn-bridge-153437060.html.